Reader KD asked me to comment on the repercussion of interest rate on savings being lower than inflation because the Fed is holding the short-term interest rate close to zero. It has been this way for several years now. The same thing happened in early 2000s when the Fed cut rates and held them too low for too long. It fueled the real estate bubble. 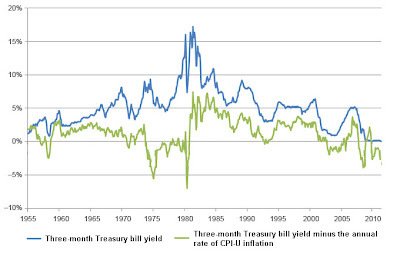 Vanguard’s Chief Economist Joe Davis posted a chart for the 3-month T-Bills yield after inflation since 1955 (green line). The chart shows the real interest rate on short-term savings — the rate after inflation — has been negative pretty much since 2002, except two brief periods when it popped up its head above zero. It also stayed negative for about 10 years in the 1970s. Real interest rates were more negative back then. As low as the real interest rates are now, I shudder to think they would go even lower, as a result of near zero nominal rates and high inflation. Mr. Davis pointed out that savers have paid the price as a result of stimulus policies. "Since December 2007, personal interest income has declined by close to $100 billion. The modest economic growth the nation has experienced since 2008 has come, to some extent, at the price of a negative real rate of return for savers." Risk, risk, and more risks. The game is to ride the wave on the way up and get out soon enough. Some people made a lot of money in the last real estate bubble. It takes an iron will not to play this game. There isn’t really much you can do about negative real interest rates. Complaining doesn’t get you anywhere. I’m not smart enough to figure out which wave I should ride or when to get out. As I mentioned in previous posts, my fixed income investments are in FDIC insured savings accounts, short and intermediate term munis, and long term TIPS. I’m waiting it out. There is only one thing you can do. Vote against the existing political establishment and vote for non-incumbents, and preferably non-Republican/Democrat. Eventually, we’ll get a Fed chairman appointed who stops stealing from those of us who save to reward the ones who steal our money. TFB, Thanks for the article. I think stocks and their performance get quite a lot of media attention – especially if they rise or fall dramatically. Also there are many prevalent theories about indexing, active management, day trading, sector funds etc. If people make or don’t make money its explained in the context of the market. Similarly there are multiple options/categories in bond funds/ fixed income category – munis, high-yield, long term, shot term, TIPS, treasury, corporate bonds etc. But they are overpoweringly at the mercy of Fed and its monetary policy which is rarely if ever transparent. As such I think the Fed should be careful in exercising its powers. If they are going to keep interest rates low for extended period of time then it should try to help out individual investors through I-bonds and giving it a non-zero fixed rate. Asking individual investors with their small amounts to take outsized risk is not fair and not progressive. Over the long term, Fed will find disfavor with the general public (even tough it is trying to help them via leveraging the monetary policy) and find its (supposedly free and independent) oversight increasingly clamped down by partisan hankering. These are real consequences, I think. Something to think over, I guess.